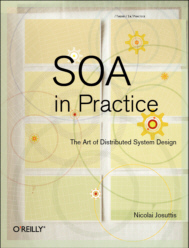 Order SOA in Practice at Amazon.com Now also available in German as "SOA in der Praxis"
SOA (Service Oriented Architecture) is hype. According to Gartner, by 2008, SOA will provide the basis for 80% of development projects. However, we see all the effects of a hype of a very new topic. Incredible misunderstandings, wrong promises, and false experts. The reason is a lack of experience. The number of successful SOA projects in the world is small and if they exist you have to find somebody abstracting and explaining how and why things work in practice. Nicolai Josuttis is this guy. As a team leader for the realization of a SOA at a world-wide mobile phone company with a heterogeneous infrastructure, about 30 service participants, and more than 300 services in production, he knows about the big difference between what is being said and promised about SOA and what it means in practice to run a SOA in a large and heterogeneous environment. 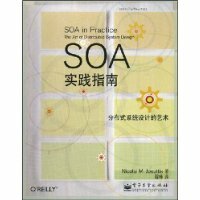 This book gives a very precise and fundamental overview of what it means to realize a SOA in practice. Starting from defining SOA and associated terms such as service, ESB, loose coupling, etc, this book is the first book that is able to present real-world problems of implementing and running a SOA of significant size in practice. Thus, you will not only learn how to categorize different SOA layers and different SOA stages of extension, you will learn how performance, security, and other real life aspects influence the business case of SOA and the way a SOA is realized. Note that this book covers the concepts and isn't just a book about WebServices or other technologies. That especially means that this book will discuss all the important aspects of successful SOA that go beyond technical aspects. Topics such as the service lifecycle, business process management, model-driven service development, and SOA governance will help to understand the corresponding processes and organizational consequences. However, even from a conceptional view, there is a lot to say about WebServices as a preferred SOA implementation platform. Why standards don't necessarily lead to interoperability, why interceptors are necessary, and the lifecycle of WSDL files, for example. In short, this book is the book to learn and understand what it means to realize SOA in practice. Facts and knowledge based on a broad understanding of large and distributed systems spiced with all important aspects based on real and significant experience. Nicolai Josuttis is an independent system architect, technical manager, author, and consultant. He designs mid-sized and large software systems for the telecommunication, traffic, finance, and manufacturing industries. He is well known both in the programming community and to attendees at various conferences because he not only speaks and writes with authority (being the (co-)author of the world-wide best-sellers The C++ Standard Library and C++ Templates) but is also an innovative presenter having talked at various conferences and events. 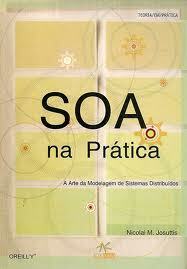 Being an expert of large distributed systems, during the past years he became an expert of SOA. As a team lead for the realization of a SOA landscape at an international mobile phone company, he knows the difference between theory and practice. Today this SOA landscape connects more than 30 distributed heterogeneous systems using over 300 services in production (each day millions of services are called). In addition, he consults different SOA projects in different countries and gives SOA tutorials both as public and in-house trainings. This book will contain the essence of all this experience. With his partner, Jutta Eckstein, he founded IT-communication, knowing that the real reason for large project failure is miscommunication and not technology. With Jutta Eckstein, the world-wide expert of agile system development in large projects, and Nicolai Josuttis, you have a combination of two exceptional experts that help to bring technical aspects of large systems in sync with organizational contexts and processes so that critical IT projects become successful.